Strong decline in food production in Argentina. DWD says no precipitation in sight (in german). 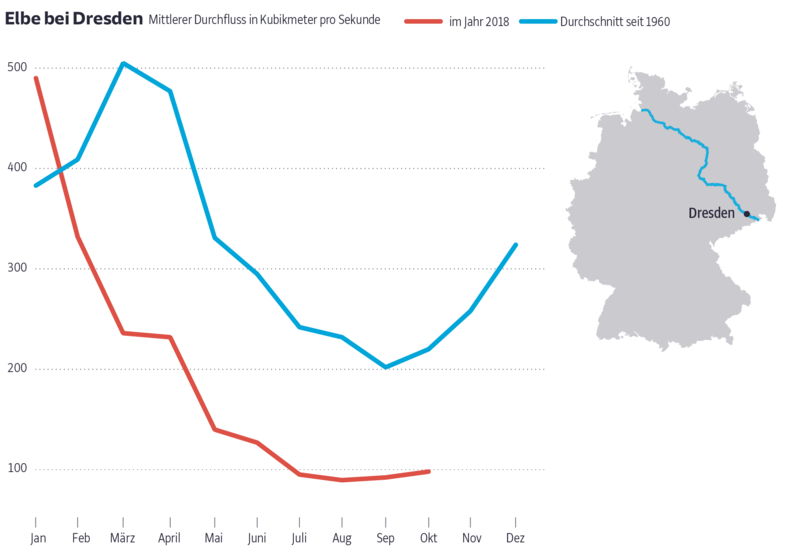 The Rhine currently has its lowest ever amount of water. In Emmerich, the water level has reached a record low of 22 centimeters (8 inches) - six centimeters below the lowest known water level on October 1st, 2003. 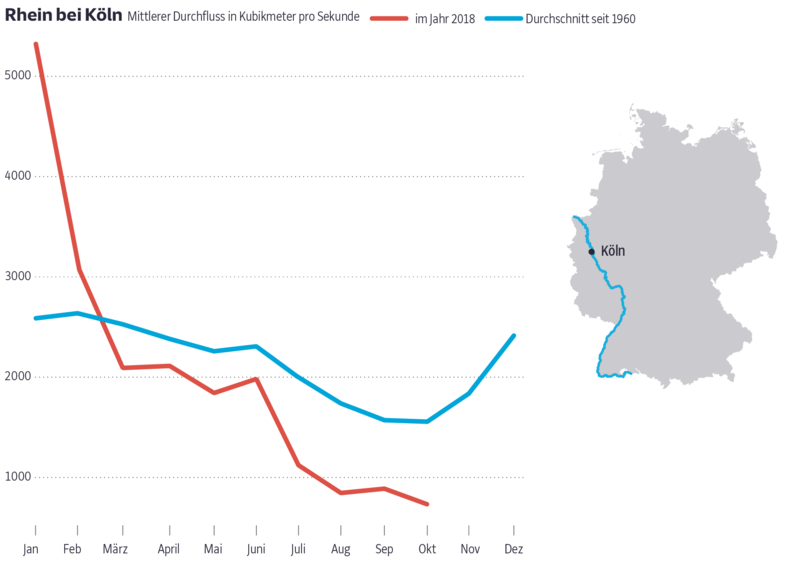 In Cologne, authorities expects the Rhine level to fall below the previous low water record of 0.81 meters from 2003 this week. For Thursday, Cologne's municipal sewerage companies expect a level of 0.80 metres. Freight firms have raised concerns about losses because of the disruption the low water levels have caused. There are also problems with passenger transport. The Cologne-Düsseldorf shipping company has discontinued its scheduled services on the Rhine. The energy company RWE is still unable to supply the coal-fired power plant in Hamm with full coal freighters, RP Online said. A company spokesman said that due to the low water level, the ships could only transport just over two thirds of cargo to the power plant. In the summer the plant had been taken off the grid for a few days because of problems with the coal supply. According to German weather reports, the Cologne area is expected to remain dry but there is a chance of some rain showers on Thursday. File this under relentless optimism: Coal supplies disrupted, reinforcing the value of renewables. ... File this under relentless optimism: Coal supplies disrupted, reinforcing the value of renewables. ... On Friday, Cologne measured a water level of just 73 centimetres (29 inches). While the railroad is able to deliver a certain amount of oil to customers, it is not nearly enough to compensate for the decreased river traffic. MELBOURNE (Reuters) - Drought is expected to cut eastern Australia’s crop production this year to less than half the average over the past 20 years, with New South Wales to be worst hit, the country’s agricultural commodities forecaster said on Friday. ... About half the farm land in southeastern Australia is suffering 1-in-20 year drought conditions, compared with more than 80 percent that was hit during the worst of the 2002-03 drought, the bureau said. The Caribbean islands are expected to see more frequent and severe droughts from reduced precipitation and increased evaporative demand due to anthropogenic climate change. Between 2013 and 2016, the Caribbean experienced a widespread drought due in part to El Niño in 2015–2016, but it is unknown whether its severity was exacerbated by anthropogenic warming. This work examines the role of recent warming on this drought, using a recently developed high‐resolution self‐calibrating Palmer Drought Severity Index data set. The resulting analysis suggest that anthropogenic warming accounted for ~15–17% of the drought's severity and ~7% of its spatial extent. These findings strongly suggest that climate model projected anthropogenic drying in the Caribbean is already underway, with major implications for the more than 43 million people currently living in this region. Climate models project significant drying for the Caribbean as a consequence of increased anthropogenic greenhouse‐gas concentrations. Between 2013 and 2016, virtually, the entire region experienced a Pan‐Caribbean drought, which was unprecedented since at least 1950. We find that human‐caused warming contributed to ~15–17% of drought severity by increasing evapotranspiration rates and accounted for ~7% of land area under drought across the Caribbean. Our results therefore suggest that anthropogenic warming has already increased drought risk in the Caribbean. Many gas stations in the region have been running dry without fresh supplies from Rhine cargo ships and winter home heating fuel deliveries have been curtailed or postponed. Some airlines operating from farther south in Frankfurt have grown concerned about their supplies of jet fuel. Most cruise ship operators in Cologne decided to shut down a few weeks earlier than usual this autumn rather than risk running aground or into a submerged obstacle in the treacherously shallow waters. Items including unexploded World War II-era aerial bombs and other ordnance as well as rusting car wrecks have been found in the increasingly exposed riverbed. Scores of abandoned bicycles, tons of metallic objects and trash and even a still-locked safe have been recovered as the waters retreated. Communities are losing power or switching to diesel as water flow to hydroelectric plants runs low. Severe drought has gripped one of the nation's wettest climates for months even though it has received more than 95 inches of precipitation this year. Ketchikan, Alaska, has recorded 96.62 inches of precipitation (rain/melted snow) in 2018 through Dec. 10. In many parts of the United States that would be an extreme amount, but in Ketchikan that's 35.94 inches below average. The Murray-Darling river basin is the most important natural water system in Australia. There has been a massive fish die-off recently - years of over-extraction has reduced river flows , so a recent drought and heatwave was enough to cause a die-off. The first-dog-on-the-moon has again produced a cartoon strip that cuts to the chase. Rockhound: "Wow. This is a god dam Greek tragedy." The rivers would fill up in the Darling River if they stopped using the water to irrigate the cotton farms and stopped allowing large mines to drain the river for mining purposes. The river is not in trouble because of the drought, it is all Govt policy and allowing cotton farmers and miners to take far more water than the environment produces. The problem of the drought is also linked to poor farming practices in QLD and NSW, where they are farming the land like the British did 100 years ago rather than look at the semi arid regions and do something that actually is workable. BUT>..... because the Australia has plundered the land, destroyed the forests and drained the rivers, what was once a vibrant region is rapidly becoming a desert. They are calling it a drought, but at some stage they will have to admit it isnt a drought, it is the new climate. And to think it was avoidable. With more heat in the region, it will only get worse.